According to the guy behind its soundtrack, Castlevania: Lords of Shadow is a more manly Castlevania game, and there's more of it on the way. Lords of Shadow hasn't been out for a week yet, but it seems that Konami was pretty confident that it would be successful, and has already put Spanish developer MercurySteam to work on a follow-up. The confirmation come from composer Oscar Araujo, who created Lords of Shadow's soundtrack, in an interview with Spanish radio. He casually revealed the sequel when he said that people who enjoyed the first game should be hopeful that the second was even more spectacular. It was known that MercurySteam was working on a new game, but until now, it wasn't definite that it was more Castlevania. Araujo also revealed that Konami was keen to change the series' image, and had asked him for a "rough, aggressive" score, in contrast to the more "effeminate" Castlevania games of previous years. 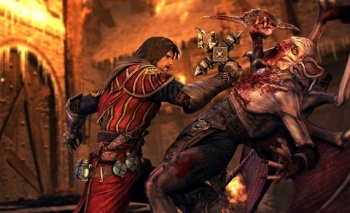 He added that Lords of Shadow was both an evolution and a new beginning for the series, and so everything, from the music to the characters, had to be built from the ground up.